Originally written by Ken Fisher on 2/1/1996 for Modern Machine Shop. Many machine shops, on occasion, have a need for welding. It may be for maintenance purposes, repair or to fill the odd contract. This story is a welding process primer for those shops whose main business isn’t welding but need to know some basics. Considering the variety of welding processes available, selecting the right one for your shop could be a confusing and difficult decision. In any manufacturing operation, matching the best process to the application can be the difference between profit and loss on a job. Likewise, welding has many variables in terms of matching methods and materials. 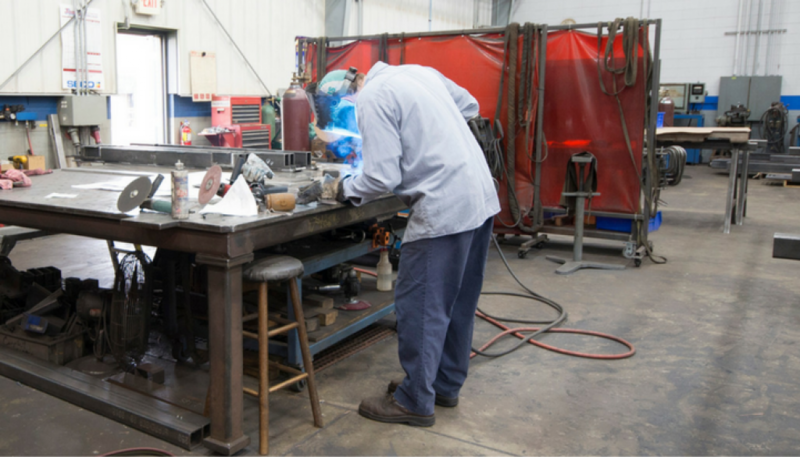 By properly selecting a welding process, many hours may be saved in production, repairs, polishing and grinding, or rejected welds. The object of welding, whether it’s done on a production basis or occasionally, is the same: to produce a quality weld in the least amount of time. Welding quality is determined by the success one has in creating a weld that penetrates sufficiently, without pores, pockets or gaps. Good surface finish is also a factor. In this article, we’re going to look at the four most common welding processes. We’ll briefly discuss what each brings to the job in terms of performance characteristics so you can better determine which welding process best fits your application. Unfortunately, there is no single welding process suitable for all welding situations. For this reason, it is necessary to weigh the advantages and disadvantages of each welding process. Next we’ll look in depth at each of the hour common welding process and their applicability to welding operations common in machine shops. This process consists of feeding a bare metal filler wire_made of the same material being welded–in conjunction with a shielding gas through a hand held torch unit. The welding wire picks up electric current supplied by a standard power source. On contact, it creates an arc that does the welding. As wire is fed from the unit to the work, it functions as a continuous, consumable electrode, therefore requiring fewer starts and stops. It’s the easiest welding process to learn. With a little practice, even a first-time MIG user can achieve a good-looking weld. Welds light gauge material or thick plate (with multiple passes). Welds all common metals_carbon steel, stainless steel and aluminum. Welding can be done in all positions, including overhead. There is no need to remove flux, as the shielding is provided by a gas. High welding speeds can be obtained_up to four times faster than stick welding_reducing repair or construction time. A power supply that gives direct current reverse polarity (DCRP) is recommended for use with the MIG welding process. Generally, welders use straight polarity current, which means the flow of electricity moves from the torch to the workpiece. In reverse polarity welding, current travels from the workpiece to the welding torch. For MIG welding, a DCRP current produces the best arc transfer and a smoother weld surface than other types of currents. A gas cylinder with 75 percent argon and 25 percent CO2, plus hoses and regulators. The same constant voltage equipment used for MIG welding also performs flux cored welding. The difference is the wire that is used as an electrode. Rather than running a solid wire coupled with a shielding gas, flux cored welding uses self shielded wire with flux inside (some flux cored wires require a shielding gas). Less affected by drafts, so better suited for outdoor work. Works as well as stick welding on rusty or dirty material. Continuous wire feed, which minimizes starts and stops. Deep penetration for welding thick sections. Increased metal deposition (two or three times that of stick welding), which is beneficial for rough hardfacing (adding material to a workpiece). Can eliminate need for a shielding gas bottle, which increases portability. Porosity is a problem for welders. It often occurs in drafty areas when flux cored welding with a shielding gas. This difficulty can be overcome by using self shielded, flux cored wire. It performs similarly to a stick welder in such conditions so windy conditions are less impactful on the weld. Importantly, the material used to fill flux cored wires can be custom formulated to match the base metal, which helps produce a better weld. This can also make flux cored welding less sensitive to rust and scale on the welded piece than other processes. Between its MIG and flux cored capabilities, a wire welder can perform most tasks a stick welder can do, and often more efficiently. While a good quality wire welder costs $450 to $2,000 (depending on its size), the costs for wire and gas are much less than that for stick welding rods. Coupled with the ability to weld aluminum and sheet metal, a wire welder can pay for itself very quickly. Precise welding on thin materials is easily accomplished, plus there is less distortion overall. Provides the highest quality work (x-ray quality) when required, as well as highly aesthetic weld beads. Allows the welder to adjust heat input while welding by using a foot or hand amperage control. Fine hard-facing_for mold and die work_can be performed. Welds steel, aluminum and other metals with just a single gas, argon. There is no spatter nor flux to remove. Power supply for TIG typically uses alternating current (AC) for aluminum and magnesium, or direct current straight polarity (DCSP) for steel, stainless steel and various other alloys. AC/DC switchable power units are available to accommodate a variety of workpiece materials. Although TIG welding is a relatively slow process, compared with wire-fed MIG or flux cored, it provides high quality welds. However, it also requires greater operator skill level than the other processes. A power supply, welding cables and TIG torch. An inert-gas cylinder and gas supply, plus hoses and regulators. TIG welding produces quality welds. Because of the variety of materials that it is capable of welding, it is considered one of the most widely used processes for precision and cosmetic work. Another factor to consider is that TIG machines also have stick welding capabilities (TIG/stick welders). While costing more than MIG or stick-only welders, a single TIG/stick machine gives the user great flexibility. This process uses a consumable, flux coated electrode containing mild steel, stainless steel, cast iron or various other alloys. These electrodes are selected to match the base material being welded. Can be performed in any position and in hard-to-reach locations. However, it’s less appropriate for overhead welding. Can be used outdoors because drafts do not affect the weld. Most materials can be stick welded. Least expensive to get started. More forgiving than MIG when welding on dirty or rusty metal. Even so, it is always advisable to scrape or grind off paint, rust, and other debris; welding on the cleanest material possible produces a stronger weld. Welding thin materials (less than 18-gauge steel) may be difficult or impossible. Marginal for welding aluminum. It takes a high degree of operator skill to weld aluminum with the stick process. You must clean the slag off the weld. Stick is a slower process than MIG. If you plan to purchase a stick welder, an AC/DC welder power supply is best. For most applications, DC reverse polarity welding offers advantages over AC. These include easier starts; fewer arc outages and sticking; less spatter (better looking welds); easier out-of-position welding; simpler learning curve, and better welds on relatively thin materials. What’s The Deal With Duty Cycle? One way of classifying the “size” of welding power sources is measuring how much amperage can be generated in a given “duty cycle.” Duty cycle is the number of minutes, out of a 10-minute cycle, a welder can operate. For example, one of Miller’s AC/DC units (Shopmaster 200) can deliver 200 amps of AC, constant current power, at a 40 percent duty cycle. That means it can weld continuously at 200 amps for four minutes. It must cool down during the remaining six minutes to prevent overheating. Duty cycle and amperage, however, are inversely proportional. Reducing amperage increases duty cycle. Operating at 130 amps, the same power supply has a 100 percent duty cycle_it can weld continuously at this amperage level. At the other end of the power curve–operating at 300 amps–it has about a 20 percent duty cycle. This is effectively two minutes’ welding out of 10. With duty cycle in mind, consider that thin metals require less amperage than thick metals. For example, to MIG-weld 18-gauge steel in a single pass takes roughly 70 amps. Welding 1/4-inch steel in a single pass requires roughly 180 amps. The phrase in a single pass is the key. Because a series of thin passes can be made to weld thicker material per pass, less amperage is required. However, multiple passes take more time. And, you may still exceed the machine’s duty cycle, spending even more time waiting than welding. What Size Welder Should You Consider? There is no universal welding power supply. Each unit has an effective working range. Here’s a general summary of which size welders match up best with a given application. For light repair work on steel, stainless steel and aluminum_from sheet metal to material 3/16 inch thick–a 130-amp MIG or TIG unit with a 20 or 30 percent duty cycle can perform many of the welding jobs required. For heavier repair or fabrication jobs, consider a MIG or TIG unit with at least 200 amps and a duty cycle 40 percent or higher. Remember, you need to have sufficient amperage to ensure proper penetration of the root (first) pass. You cannot make up for a poor root pass with subsequent passes. By properly considering the many factors of your application, and examining the advantages that each welding process offers, selecting the right welding power source can be a simplified and profitable decision.